Home » QuickBooks Customer Services » How to Restore a (.QBB) File in QuickBooks? How to Restore a (.QBB) File in QuickBooks? What is QBB file and why does it require restoring how can one restore the QBB files? Well, the QBB file is the backup of QBW files. These files contain or store the essential data of company. The financial records, images, logos, letters, images, and such date are stores in the QBB files. So, restoring the recent file is important as you know that you cannot run a business without the required data. However, there is no reason why you should lose the peace of mind as it is not quite a tough task to restore a QBB file in the QuickBooks. Be it from the local hard drive, CD, network drive, USB flash drive, or from any other media; it is pretty simple to restore QBB file in QuickBooks. Insert the USB flash drive, CD or other storage device in the appropriate drive if the backup file is not on the network folder or hard drive. Launch and open QuickBooks and go to File menu. Click Open or Restore Company and open the restore wizard. 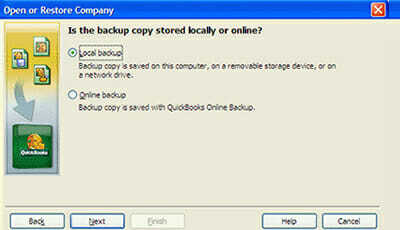 Select Restore a backup copy QBB and click ‘Next’. Select ‘Local backup and click ‘Next’ again. Here you will see that the Open Backup Copy window opens. If required, you may scroll down the drop down menu and find the backup file location which contains the .qbb file extension. Select backup file and click ‘Open’ and click ‘Next’ again. If required, you may click ‘Save’ and scroll down to the location where the backup file is to be restored. Select backup file and click ‘Save’. In case QuickBooks displays any message, respond to it accordingly. Tip#1: What support available for QuickBooks Accountant Desktop 2017 for Professionals. In case QuickBooks finds the file with the same name in the specified folder, it may ask whether you want to replace it. Here, you should click ‘Yes’ only if you want to replace the file. Once you click ‘Yes’, the existing file will get deleted and replaced by the present backup file data you are restoring. If you are not certain about whether to erase the existing data, you may select ‘No’ and restore the file by renaming it differently. Tip#2: Do you know Why qbdbmgrn not running on QuickBooks 2016. If you are doing it for the first time, you may feel a bit confusing. However, if you closely follow the steps mentioned above, you can do it without undergoing any hassles. Moreover, you have all the freedom to talk to the QuickBooks experts if you face any difficulties.